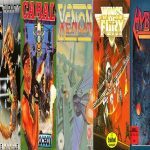 Enemy Territory: Legacy has been released for AmigaOS4.x during winter 2016 by HunoPPC. A new update (Version 2.71b) has been released for improved minigl render, improved sound quality, improved LAN support and much more. Enemy Territory: Legacy is a modification of the free multiplayer first-person shooter Wolfenstein: Enemy Territory. After two decades of peace the world is burning again and it‘s time to choose sides. Battle it out to restore order in the world in this class-based first-person shooter that emphasizes teamwork and strategy over lone-wolf game play. Set at the West Front during World War II the player can choose from different classes to once and for all defeat the enemy in historically inspired battles. There are six officially released maps that are partially based on real locations or events (North African Campaign: Gold Rush, Siwa Oasis, and Atlantic Seawall Battery; Europe Campaign: Rail Gun, Würzburg Radar, and Fuel Dump), as well as hundreds of custom maps made by the gaming community. On most maps, the offense needs to complete a certain set of objectives within a limited amount of time. The defense needs to keep the offense from completing objectives until time runs out. Some objectives may be optional, and some objectives can be carried out by either team. These minor objectives assist the team completing them. Depending on game mode the action will continue on another map (Campaign Mode) or the same map (Objective Mode, Stopwatch Mode, Last Man Standing).